Seriously…..if you don’t buy nearly everything on Amazon….are you even breathing? I’ve probably been asked 38498384820 times to put together a list of all my “must-haves”. It’s tough because while I do have some serious ride or dies, I do switch it up from time to time. Example - I used to be die-hard GG but we ALL know I’m now Wasa’s #1 fan. Also, like, my skincare routine. I’m not super brand-loyal. I just use what WORKS and if I find a new moisturizer I love more than the last, I’m obviously going to switch it up, ya know? I didn’t really want to make a list and then post it, because it could completely change in 6 months! 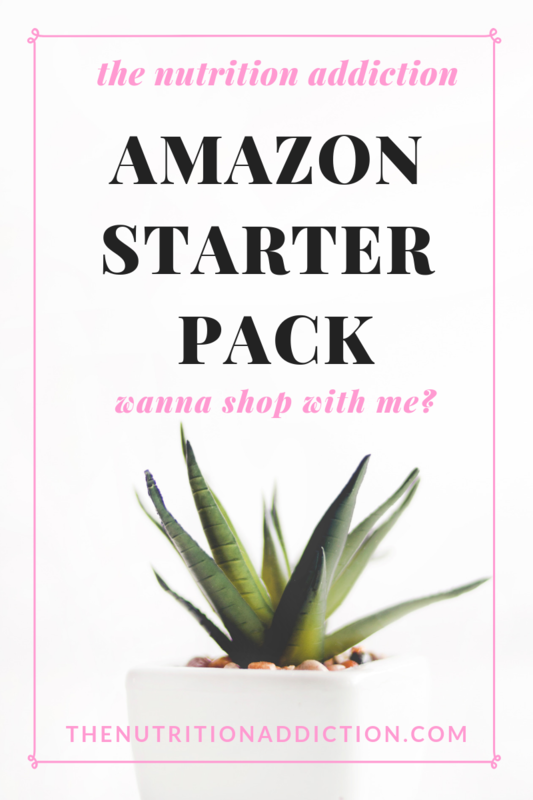 So, I created an Amazon Shop! And my plan is to go in once a month - I’ve even put a standing date in my calendar - and update it according to what items I’m currently using regularly. I might delete something, add something else, swap something out. You’ll definitely want to bookmark this and refer back to it to see what I’m using at the moment. Basically I just sat down and went through my past orders and plugged my regular purchases into the store. That’s about it. Just the basics. I’ve got some of the food items I order on Amazon (love to order my favs in bulk), my kitchen essentials, my fav skincare products, clothes (mostly oversized sweatshirts LOL) and supplements! Loooove to order my supplements on Amazon when I’m not ordering from Perfect Supplements. I wanna start my highlighting some of my absolute favs - the stuff I’m just wild about right now. Then, head over to my shop and just go nuts. Literally cannot live without this little tool. I use it to make my loaded lattes in the morning (we’re talking hot or iced coffee, collagen peptides, acacia fiber, and some sort of fat like coconut milk, organic heavy cream, or Omega Power Creamer in Cinnamon) or my Matcha Lattes or my Magnesium Tea with Ora Organics Probiotic Powder and Raspberry Lemon Natural Calm Magnesium (my nightly evening situation). I actually have no idea how I lived life before discovering this thing. I even pop it in my bag before I go to the coffee shop to blend in my travel sized collagen an acacia fiber (of course). I linked to a pink one, but mine is silver. You know as soon as mine dies though I’m getting this pink one! LOOOOVE! Ok, so I definitely get these at the store, too, but on Amazon you can buy in bulk and just pretty much never run out. I also really like the multigrain because it’s a little higher in fiber and lower in carbs than the others, and sometimes I can’t find them at Kroger. Anyways, love to sort of use these as a replacement for bread. Top them with turkey, pickles, avocado, cream cheese - ugh, what a combo. Also love some egg salad with microgreens. Or goat cheese and mashed blackberries. I could really go on. Honesty, I can’t imagine ever not using this hair rinse. Over-shampooing is so had for your hair - totally dries it out and it’s especially bad for anyone with color-treated hair. I’m platinum, so it’s absolutely essential for me to only wash my hair with shampoo every 10 days or so. I use this in between shampoos and it cleans my hair and gives me tons of volume. Obsessed with this stuff! I put it in my coffee every morning to get a boost of 6g fiber before I’ve even started my day. Fiber is soooo important for your health and it’s an incredible weight loss tool. The brand I use is super inexpensive, and it has NO flavor. I’ve been using this stuff for YEARS. This is a yummy magnesium drink that I make into a tea at night. I get the raspberry-lemon flavor and I’ve recently been adding Ora Organics Probiotic powder in cran-apple and it tastes just like a Sweet Tart. The majority of people are actually deficient in magnesium so it’s really important to supplement with it. It’s can help you really relax at night, it’s great for digestion, and it’s also really effective preventing headaches. To see ALL my fav Amazon products, go to amazon.com/shop/thenutritionaddiction. BOOKMARK IT!